The Karelian Bear is very popular in its country of origin: Finland, and it's gaining ground in the USA as well. 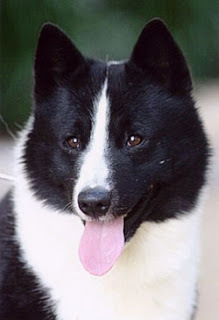 In Finnish, the breed's name is Karjalankarhukoira, and in the Swedish-speaking parts of Finland, it is called Karelsk Björnhund. The Karelian Bear is known for being tenacious. This is a hunting breed with fearless nature and lightning reflexes - the breed's name comes from the ability to protect against bears. Nowadays the dogs are also used for search and rescue work and dog sports, such as obedience trials. Washington State employs Karelian Bears for non-lethal bear control in their department of fish and wildlife. The Karelian Bear prefers to be outside, and needs plenty of space to run. This is an intelligent and independent working breed, which means they also get bored easily and need mental stimulation. These dogs generally love people and children, but they can be suspicious towards other types of dogs, and as all breeds they should be socialized at an early age. Their extreme affection for humans can make them prone to separation anxiety - they want to be by their person's side at all times.